Our Battles of the Rhine Tour is a one-of-a-kind tour. 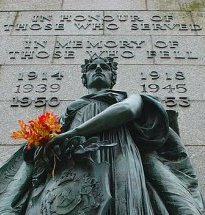 Most BOR tours are ceremonial in nature and focus on the most famously mentioned names like Groesbeek Canadian War Cemetery, the Reichswald War Cemetery, Groesbeek & Nijmegen. Of course, we visit these sites too, but so much more. We think it is important for Canadians to know how a majority of those 2300 Canadian heroes resting in Groesbeek, lost their lives. We will take you to the battlefield sites where these Canadian heroes lost their lives. This will bring so much more meaning to your visit to this beautiful cemetery. Where were they killed? What battles?. We follow in the footsteps of 2nd CDN Corps, most notably 2, 3rd and 4th Division. Our tour starts at the South Mill, in Groesbeek. In the cupola of this mill was planned the spring offensive of 1945 by 400.000 British & Canadian soldiers, commanded by Canadian General Harry Crerar, that cleared the Rhineland up to Wesel & allowed irresistible Allied armies to cross the Rhine and end the war. First, on January 21st, Corps Commanders Lt- Gen Simonds (2nd Cdn) & Lt-Gen Horrocks (30th brit) climbed to the cupola to relate the terrain to their maps and allot divisional objectives. Then came dozens of officers, from division commanders down to platoon leaders, to study the ground over which the attack would go forth on Feb 8, 1945 behind the heaviest barrage of Word War 2. The crucial role of this mill, as the prime observation post for guns in the Nijmegen Salient, has been immortalized in The Guns of Victory by George G. Blackburn, who as an artillery forward observation officer, spent much of the winter of 1944-45 in its cupola.There is a plaque on the mill dedicated to Capt. Blackburn, who was a personal friend of mine. George sent me copies of his field maps of Normandy many years ago. These maps figure prominently in my Normandy tours. At NO time in the whole war was the enormous extent of the Nazi military power more evident and, in a way, more awe inspiring than in January, 1945, when, assaulted from the east, south and west, the vast military machine moved into its dance of death, and strategy into its last phase. Eighty five divisions faced eighty five divisions west of the Rhine, on the last battlefield, and in its death throes the German Army was still a most terrible and potent force. On January 14, 30th British Corps Headquarters moved north to join, and, be under command of the 1st Canadian Army Headquarters, where they planned “Operation Veritable.” The intention was to destroy all enemy forces between the Maas and the Rhine from Nijmegen to the general line Julich-Dusseldorf. The stage was fast being set and the task was immense. It would be the last great battle paving the way for the final assault across the Rhine. The battle was originally scheduled the first part of January when the ground would still be frozen and would allow for the relatively easy movement of the armour. However, because of the Americans fatal mistake of becoming bogged down in the Hurtgen Forest, the start date was set back to February 8. By this time, the ground had thawed and coupled with the Germans blowing all the main dikes, the ground conditions became appalling. It thawed, froze, fogged, snowed and rained, sometimes all five in a mushy mixture, all within 24 hours. It was always bitterly cold in what was the worst winter on record. All of which made the movement of armour and artillery almost impossible. The opening of the Port of Antwerp by the Canadians, had enabled Gen. Crerar, commanding the 1st Canadian Army, to assemble a vast weight of materials in the Nijmegen bridgehead in preparation for Operation Veritable, the Battle of the Rhineland. The final period of the buildup began on January 25th. Seldom, if ever, has so much activity, so immense an expenditure of energy, taken place in so confined a space. The result was swelling to the ranks of Canadian 1st Army to 13 divisions, 3 armoured brigades, to 30th Brigade of 79th Armoured Division (British), 5 artillery groups, 2 anti-aircraft brigades and the Canadian Rocket Battery. The ration strength of the Canadian 1st Army, together with attached personnel,reached a peak of more than 470,000 men of which nearly 400,000 were fighting troops. 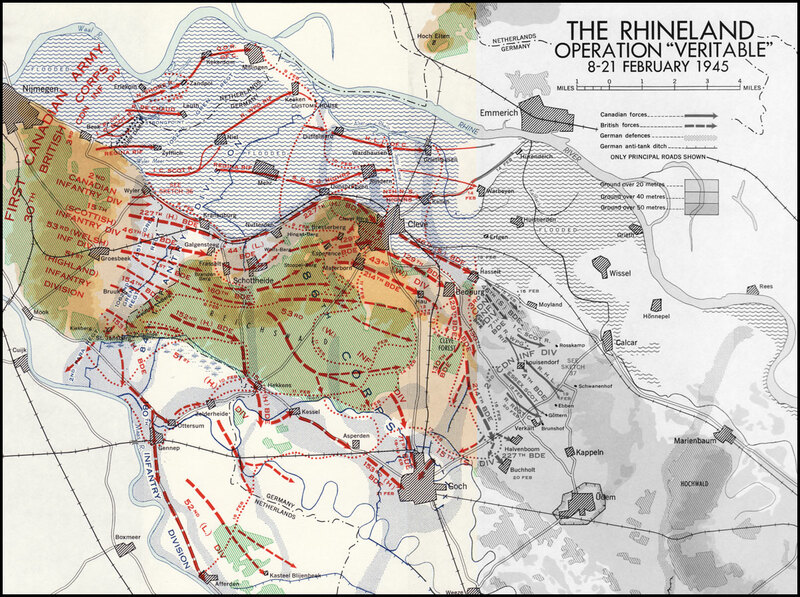 All these would funnel through the narrow space between Grave and Nijmegen to debouch into the Reichswald Forest, and close the west bank of the Rhine from Emmerich to Wesel, from the Nijmegen-Kleve-Emmerich road on the left to the Geldern-Xanten road on the right. It is essential to the layman, in considering such a battle, to lend his imagination to the meaning of such numbers of men and quantities of equipment, in terms of movement, food, ammunition and the expenditure of the intricate paraphernalia of warfare as it was in the mid-Twentieth Century. 35,000 vehicles and 1,300,000 gallons of fuel, just to move these troops and their equipment to their assembly points. Many hundreds of trains and thousands of vehicles in constant transit were essential to their supply and continued movement. 1,880 tons of bridging equipment were used to bridge the River Maas at four points prior to the battle. Seven bridges would be needed and because of the flooding 400’ of folding-boat equipment were brought forward to meet the emergency. A steady intake of 7,250 tons of supplies each day had enabled General Crerar to amass 250,000 tons in his stockpiles. In the last stages before the battle the daily maintenance reached 10,000 tons, which included 2,800 tons of ammunition. The variety of goods was very wide, from drugs and medical supplies, and boots to shells for the super heavy guns. A great array of buoys to mark channels in the flooded areas seemed grotesque, adding a whiff of the sea to the saturated inland scene, and this impression was enhanced by large numbers of amphibious vehicles constantly to be observed in the forward areas. In addition to the immense road building and repairing tasks of the engineers and pioneers, it was necessary to build 95 bridges, each 75’ long, to span huge flooded craters 12’ deep and up to 70’ in diameter, blown by the enemy with 500 lb. bombs in the few existing roads. Traffic control police in close collaboration with the engineers were forced to reroute traffic each day, and to add to these problems, essential traffic moved mainly by night, especially to the gun sites. The dumping program for ammunition began on January 25th and was completed on the night of 1st/2nd February. In that period 500,000 rounds of ammunition of 350 different kinds, and weighing 11,000 tons were moved forward to the gun sites and camouflaged. At that time many of the batteries comprising a total of 1,034 guns of all calibers, including more than 300 medium, heavy and super heavies, had not reached their positions. Errors in distribution would eliminate batteries. There were no errors. Anticipation of extensive flooding had caused the assembly of more than half a million gallons of fog oil for burning in a probable 100,000 smoke generators in case it should be necessary to mask the whole of the left flank. These were in addition to the normal smoke supplies. The Signal Corps also made heavy demands, and supplies included more than 8,000 miles of 4 different kinds of cable, 151,000 yds. of assault cable and 14 pairs of double armoured submarine cable to be laid across the Maas. It would be possible to compile a dozen lists equally impressive, and all these materials had to move constantly under cover through Nijmegen and over the Maas-Waal Canal, through Grave to Mook, or over the few roads between these 2 points. On February 8th, it was estimated, trains would run into Nijmegen itself, right behind the battlefield, and in the month of February alone 350,000 tons of supplies would feed the stockpiles. On January 31st a thaw added suddenly to the burdens of the army road maintenance personnel and served further to compress the great weight of transport moving in continuous streams into the area held within the loop of the Maas between Nijmegen and Grave. In every village and town the troops were assembling fast. Tilburg and s’Hertogenbosch were crammed with men and vehicles. Conferences were in constant session, and commanders from generals to 2nd lieutenants studied the 800,000 special maps and 500,000 air photographs, together with massive sheaves of orders, which had been prepared for them. On February 4th the troops detailed for the opening attack began to move forward into the 6 mile wide funnel between Nijmegen and Mook. They moved essentially on 2 roads, the one through Nijmegen itself to the left flanking position, and through Grave to the right flank. In scores of villages and towns in south west Holland, the forward brigades of 2nd and 3rd Canadian Divisions, who would spearhead the operation, made ready for battle.Thus, on the morning of February 4th, 1st Canadian Army, along with attached British formations, stirred to the opening phases of mounting the greatest battle of the campaign since Normandy. Montgomery knew that his forces would face the most powerful troops and defensive positions remaining to the enemy on the western front. He also knew that if the Americans failed in their attack (which they did) on the dams in the Hurtgen Forest, the Germans would move massive reinforcements north to face the Canadian 1st Army(which they did). The Canadian 2nd and 3rd Divisions had maintained their forward defensive localities on the fringe of the Reichswald Forest proper, in the area of Groesbeek, immediately facing the forward defensive system of the German Siegfried Line running from Wyler to anchor on the Maas south of Mook. Throughout all the long and bitter 1944 winter of preparation these Canadian troops alone had held the bridgehead, actively patrolling and denying information to the enemy. Up to the very eve of battle, no enemy patrol could hope to gain the identification of any unit other than Canadian. The Canadian positions around Groesbeek would be the starting line for the attack which would open the Battle of the Rhineland. It would be essential for the Canadians to secure the village of Den Heuvel, gain Wyler, and thus open the main road through from Nijmegen to Kranenberg. The Reichswald was a state Forest cut into rectangles by long tracks and trails, giving long fields of fire to the German defenders. The forest was closely planted, and giving a visibility of no more than a dozen yards except in the clearings and along the path. Old clearings had become thickly overgrown with low scrub, but the new fields would give fields of vision up to 200 to 300 yards. There were small groups of deciduous trees. Maps were unreliable, and air photographs had failed to add precise knowledge of the conditions on the ground. Many of the trails and tracks were overgrown; others were sandy. It was certain that the going would be hard or impossible for wheeled or tracked transport. Two new roads of concrete ran through from north to south, from Cleve converging at Hekkens, the one curving through Kranenberg-Frasselt, the other through Bedburg. These roads enclosed roughly the central third of the forest area, including the neck of high ground known as the “Materborn” feature, covering the town of Cleve. From the Hekkens crossroads the road runs west to Gennep and south east from Asperden to Goch. The main Cleve-Goch road bounds the forest to the east. Beyond it lies the railway and the small forest of Cleve, a tight square mile of trees in the center of the position. The heavily fortified town of Goch was surrounded by a maze of concrete pill boxes anchored to the two main defensive systems of the Siegfried Line, the westernmost covering the Kranenberg-Frasselt-Hekkens-Goch road, the other anchored on the defenses of Cleve in the north, passing behind the forest of Cleve, sited east of the railway line to Goch. Beyond this lay a third main defensive system running from Rees forward of the Hochwald Forest and continuing south to Geldern. This was known as the Hochwald layback (gap), the last line of defense covering the Rhine and Wesel road and rail bridges. The immediate defense s of the whole area consisted of continuous trenches along the east bank of the Maas, and an anti-tank ditch covering the western edge of the Reichswald Forest.These first defensive positions were organized for 2,000 yards in depth. Roadblocks and anti-tank guns covered all roads, trails and tracks. Trench systems had been dug to defend the Materborn Feature, linking in with the main defenses of Cleve. Further trenches and strongpoints had been developed at Nutterden and Donsbruggen on the road between Kranenberg and Cleve. Isolated farms in the Reichswald and small villages everywhere, were known to be strongpoints and self-contained “boxes of defense.” Mine fields and wire had been laid on an elaborate scale. The whole area of the battlefield comprised of floodplains of the Rhine, Maas and Niers Rivers, low undulating forest alternating with marshes, backwaters and flood channels. Tall poplars revealed the lines of many ditches and orchards, often surrounded the smaller villages.The River Maas was flooded up to 1,000 yards beyond both banks, and the River Niers had overflowed to turn its water meadows into swamps. In the north, the Rhine floods had converted the land north of the Nijmegen-Cleve road to a series of inland lakes, This whole formidable area, with Cleve and Goch as the hinges of its powerful and narrow jaws, had to be forced against the finest troops remaining to the German Army in the west, the1st Parachute Army, Army Group H. These troops were highly trained, young and were as dedicated and fanatical as were Hitler’s youth SS Divisions (1st SS LAH Leibstandardte Adolph Hitler & 12th SS Hitlerjugend). 2nd Canadian Division was positioned Inside Left and were to capture Den Heuvel and Wyler and open the main road to Berg-en-Dal. 3rd Canadian Division was positioned Outside Left and were to protect the left flank; capture and clear the low ground between the main road Wyler-Kranenberg-Cleve and the Rhine up to the line of the railway Cleve-Griethausen. The battles to come has been described by many veterans who also fought in Normandy, as the most ferocious and intense battle of the entire war. It was comparable in intensity to the Battle of the Scheldt. The offensive opened early on 8 February. Luckily, the weather was favourable to air support. During the night the waiting troops had heard up to 769 heavies of Bomber Command roaring overhead on their missions of destruction against Cleve and Goch. Then 95 Stirlings and Halifaxes from No. 38 Group R.A.F. unloaded more than 400 tons of bombs on Weeze, Üdem and Calcar. The flashes of the explosions and the fires which they started could be plainly seen by the soldiers in their assembly areas west of the Reichswald. At five in the morning the artillery preparation began. As we have noted, the artillery support for Operation “VERITABLE” had been planned as a major battle-winning factor. The concentration of fire which fell on the German 84th Division that day was probably not equalled on a similar front during the entire war in the west. It was calculated that 1034 guns–one-third of them mediums, heavies and superheavies–were engaged in the bombardment. Seven divisional artilleries, five Army Groups Royal Artillery, and two anti-aircraft brigades struck this massive blow, which was designed to harass the enemy’s headquarters and communications, silence his batteries and mortars and smash his troop positions, destroying his forces and demoralizing survivors. In five bombardments during the day an average weight of more than nine tons of shells was to burst on each of 268 targets. The cannonade was augmented by four divisional “Pepper Pot” groups, which swept the front continuously with the coordinated fire, at relatively short range, of all available tank guns, anti-tank guns, light antiaircraft guns, medium machine-guns and heavy mortars.25 Rocket salvoes from the 12 projectors of the 1st Canadian Rocket Battery saturated thirteen targets in and about the German forward positions. At 7:40 a.m., after a smoke-screen had been laid down across the whole front, there was a brief lull in the firing. As expected, these combined warnings lured the enemy into manning his guns and bringing down his defensive fire against an expected attack. The virtual silence that covered the battlefield for ten minutes enabled sound-rangers to locate one hostile battery and nineteen mortar areas. Then the bombardment thundered out anew, and it seemed as though every hostile position must be completely smothered. “It was good to see and hear”, wrote The Calgary Highlanders’ diarist, “especially to any of the old timers, as so many times we have gone in and would like more support than we got.” The preparatory programme reached its climax as the barrage opened, and new notes were added by the sounds of armour grinding forward and aircraft roaring overhead. Afterwards dazed German prisoners told interrogators a grim story of disorganization–communications totally disrupted and gun-crews unable to man their guns until the barrage ceased. They said that the prolonged strain of the bombardment had created “an impression of overwhelming force opposed to them, which, in their isolated state, with no communications, it was useless to resist”. The guns had done their work so well, and so completely was the enemy surprised, that the initial attack met only light opposition. On the Scottish Division’s left the 2nd Canadian Division had the tasks of capturing Den Heuvel and Wyler and opening the Nijmegen-Cleve road to just short of Kranenburg. With the bulk of his forces spread across the Corps front to screen the impending attack from the enemy, General Matthews gave this assignment to two battalions of the 5th Brigade. A small triangular area south of the highway about Wyler was regarded as the northern anchor of the enemy’s front line, and its early seizure was essential to the rapid advance of the 15th Division beyond Kranenburg. In order to surprise and seal off the force defending Wyler, Brigadier Megill avoided the direct approach from the northwest, and instead ordered his left battalion to by-pass the town and cut the highway beyond, thence attacking Wyler from the rear. So effective was the counter-battery and counter-mortar preparation on the 5th Brigade’s front that there was virtually no reply from the enemy, and the two assaulting battalions formed up without a single casualty. Keeping well up to the barrage The Calgary Highlanders struck eastward through Vossendaal to the main highway, about half a mile beyond Wyler. Mines were the chief obstacle; the Highlanders suffered 24 casualties from Schü-mines, which the enemy had cunningly laid in visible rows on the ground interspersed with others hidden below the surface. “A” Company now advanced down the road and by midday had made contact with a battalion of the 15th Scottish Division on the outskirts of Kranenburg. On The Calgary Highlanders’ right Le Régiment de Maisonneuve found that the bombardment had greatly simplified their task. They occupied with little difficulty the shattered remains of Den Heuvel(where an officer counted 46 enemy dead in a small area, “without examining slit-trenches”) and cleared to the apex of the brigade’s triangle at Hochstrasse. While sappers of the 7th Field Company R.C.E. began work on the highway west of Kranenburg, The Calgary Highlanders’ “C” and “D” Companies turned back towards Wyler. The former, on the left of the road, ran into stiff fighting in which the company commander and a platoon commander were killed. To keep the operation moving the Commanding Officer committed “B” Company, and after supporting fire had been called down on the objective, “B” and “D” pressed on into Wyler, reporting it clear by 6:30 p.m. Early plans had called for the roads forward to be open for traffic by four o’clock, but with the delay in taking Wyler it was nine before the sappers could report all routes free of mines. The operation had cost the battalion 67 casualties, including 15 killed. The Maisonneuves lost two killed and 20 wounded. The brigade had taken 322 prisoners, most of them having been trapped in Wyler. On the 30th Corps’ watery northern flank the 3rd Canadian Division’s part in “VERITABLE” did not begin until 6:00 p.m. General Spry’s task was to secure the left flank of the 2nd Canadian and 15th Scottish Divisions and clear the area between the Nijmegen-Cleve road and the river. This would be done by the 7th Brigade on the right and the 8th on the left as far as the anti-tank ditch from Donsbruggen to Duffelward, at the edge of the main Siegfried Line. The 9th Brigade was then to break through these defences and advance east to the Spoy Canal, which led from Cleve to the Alter Rhein. The effects of the sudden thaw and the heavy rains were more apparent on the 3rd Division’s low-lying sector, the Waal Flats, than anywhere else on the whole Corps front. Drainage ditches that would normally have carried off the excess water were too badly damaged by gunfire to function effectively. The Waal had been rising steadily since 3 February. Records covering 34 years showed that only six times in that period had the February peak level at Nijmegen exceeded twelve metres. Yet on D plus 1 of “VERITABLE” the river was to pass this height, and to continue to rise to a top of 12.69 metres on 17 February. Earlier in the winter the Germans had breached the main dyke at Erlekom, four miles east of Nijmegen, and on the 6th water began pouring through this gap. Two days later the mile long Quer Damm just inside the German frontier, weakened by the enemy’s digging of defence positions, collapsed before the pressure of the rising floods. Through the break water began pouring eastward towards the villages of Zyfflich and Niel. By D Day most of the 3rd Division’s area of operations was submerged. On 3 February “soft-going” plans had been substituted for those previously made. This meant principally that the infantry would ride to their objectives in amphibious vehicles (the 79th Armoured Division provided 114 Buffaloes), and would be largely deprived of armoured support. Only in the initial stages of the 7th Brigade’s attack could the advance be made on dry ground. The Regina Rifle Regiment, attacking under artificial moonlight, and supported by tanks of the 13th/18th Royal Hussars (Queen Mary’s Own), seized the south end of the Quer Damm, and by eight o’clock had cleared Zyfflich, a mile to the east, digging about 100 prisoners out of its cellars. “B” Company of the Canadian Scottish, after two unsuccessful attempts to capture a strongpoint at the north end of the Quer Damm, finally took it at first light on the 9th. The battalion’s remaining rifle companies, embarking in Buffaloes from the Wyler Meer, set course by compass through the darkness for Niel, two miles east of Zyfflich. Communications failed, and shortly after midnight the C.O., Lt.-Col. D. G. Crofton, headed towards the objective with his command group in two amphibians. But Niel was still in German hands, for the Scottish “A” and “D” Companies through faulty navigation had become engaged with a group of houses 1500 yards to the south-west. Crofton’s party ran into point-blank fire from houses on the western outskirts. Two officers and two men were killed, and the C.O. and his Intelligence Officer were among the wounded. Day was breaking when “A” and “D” Companies arrived to clear the village. On the division’s left flank two Buffalo-borne companies of the North Shore Regiment, leading the 8th Brigade’s attack, quickly secured the main dyke west of Zandpol and by 9:00 p.m. had reported the village itself free of enemy. Farther south Le Régiment de la Chaudière, forced at times to wade through three feet of water, occupied Leuth early on the 9th, opening the way for the brigade’s next phase of operations. “VERITABLE” had made a good beginning. On the first day of the battle the 30th Corps had broken through the enemy’s strong outpost screen and closed to the main Siegfried defences. It had inflicted severe losses upon the ill-fated 84th Infantry Division. Taking more than 1200 prisoners and killing a good many men besides, it had virtually destroyed six German battalions. There was encouraging news from prisoners who had helped to dig trenches in the Reichswald that the main defence line contained no concrete works. The problem now was how to exploit our gains before enemy reinforcements arrived in strength. The rapid deterioration of the maintenance routes forward was seriously impeding deployment of General Horrocks’ formations. Particularly disturbing was the flood situation; between 1:00 p.m. and midnight of the 8th the water level north of the Nijmegen-Cleve road had risen eighteen inches. The Siegfried Line is Breached- On 9 February low-hanging clouds and heavy rain which persisted well into the afternoon put a stop to our hitherto excellent air support and indicated still worse going across the waterlogged fields and along the churned-up tracks of the Reichswald. The 2nd Canadian Division, having completed its limited task, had been pinched out of the battle, leaving four divisions to continue the advance during the next 24 hours. The Canadian Typhoon and Spitfire wings in No. 83 Group were actively employed on rail interdiction east of the battle zone and also flew armed reconnaissances over roads. Pursuing its sweeping manoeuvres over the flooded Waal Flats, the 3rd Canadian Division, whose sector now covered more than half the Corps front, took its village objectives one by one. In the 8th Brigade’s advance next to the river the North Shore Regiment found that enemy resistance lessened as the flood waters deepened. The New Brunswickers met little opposition in capturing Kekerdom, and from there Brigadier Roberts sent the previously uncommitted Queen’s Own Rifles of Canada forward to establish themselves without difficulty in Millingen. The capture of Niel had given The Royal Winnipeg Rifles a base from which to extend the 7th Brigade’s operations eastward. During the afternoon “A” and “B” Companies occupied Keeken and “C” pushed on to the Customs House on the Alter Rhein, an operation which the Brigade diary termed “quite sticky with a good bag of PWs”. In Brigadier Spragge’s right sector the Regina Rifles found Mehr free of enemy troops. Its capture ended the 7th and 8th Brigade’s tasks. Indeed, the rising water virtually cut off the battalions on their objectives, where they had to exist as best they might until Buffaloes became available to evacuate them.50 It remained for the 9th Brigade to complete the 3rd Division’s role in the first phase of “VERITABLE”. But while the northern tip of the Siegfried Line had still to be overcome, before the second day of the battle ended the main defences had been penetrated by two of the divisions attacking south of the Nijmegen-Cleve road, and on the Corps’ right flank the Highland Division’s 153rd Brigade had cut the important Goch road at two points between Mook and Gennep. Units of the 6th Canadian Brigade could see the 1st Gordon Highlanders working southward across their front clearing out the area between the Kiekberg woods and the Maas, and on several occasions were able to assist with information about enemy movements. Meanwhile the 152nd Brigade, passing through the 154th, had fought forward through the southern half of the Reichswald as far as the Kranenburg-Hekkens road, just short of the main entrenchments. Farther north the 53rd Division had measured off substantial gains. Attacking at 8:30 a.m. from the positions gained during the night, two Welsh battalions of the 160th Brigade, supported by the 9th Royal Tanks, pushed two miles eastward to the Stoppel-Berg, a circular mound 300 feet above sea-level and the highest point in the Reichswald. The 2nd Battalion The Monmouthshire Regiment* captured the hill after sharp fighting. The stiffening enemy resistance was evidence of the arrival of strong reinforcements, as were the determined counter-attacks launched against the East Lancashires holding the Kranenburg equines road. These were beaten off with the aid of eight tanks of the 147th Regiment Royal Armoured Corps which had mastered the almost impossible roads forward. Before the day ended the 6th Battalion Royal Welch Fusiliers, exploit beyond the Stoppel-Berg, had reached the north-eastern edge of the Reichswald overlooking Materborn, whence supporting tanks found attractive targets in traffic on the Cleve-Hekkens road, now the enemy’s main lateral communication through the forest. But it was in the corridor between the northern edge of the Reichswald and the flooded Canadian sector that the most spectacular progress had been made. The 15th (Scottish) Division’s original plan to advance by leapfrogging its brigades and battalions in successive phases was frustrated by the appalling conditions of mud and traffic congestion on the routes forward. Day had broken by the time the 44th Brigade’s Special Breaching Force had bridged the anti-tank ditch at three of five planned crossing places east of Frasselt. At 6:15 the 6th Battalion The King’s Own Scottish Borderers, borne in Kangaroos of the 1st Canadian Armoured Personnel Carrier Regiment, began to cross. (Their eight-hour journey forward from Nijmegen was afterwards described by the K.O.S.B. battalion commander as “a remarkable display of skill and endurance by the drivers of the APCs”.) By eight o’clock the K.O.S.B. had cleared Schottheide, 500 yards to the east; shortly afterwards the 2nd Battalion The Gordon Highlanders, advancing along the main road from Kranenburg, were on the outskirts of Nutterden. There was no sign of the battalion which had been detailed to exploit these gains. Accordingly, the Borderers went forward again in Kangaroos to capture the Wolfs-Berg and the HingstBerg–a pair of knolls between Nutterden and the forest. These were taken about midmorning with the assistance of a squadron of Grenadier Guards tanks; and the clearing of Nutterden by the Gordons completed the second phase of the Division’s attack. The operation was now eleven hours behind schedule and it was imperative to carry out the final phase–the capture of the Materborn heights overlooking Cleve–before the Germans further reinforced these key positions. Since there was no hope of bringing the 46th and 227th Brigades forward in time as planned, the G.O.C., Major-General C. M. Barber, was compelled to order the Lowland Brigade to push on still further.57 The 8th Battalion Royal Scots seized the Esperance hill, the nearer of the brigade objectives, with little difficulty. The K.O.S.B., climbing once more into their Kangaroos, headed along the muddy tracks for the Bresserberg feature, less than half a mile from the city. They reached their goal with a scant half-hour to spare; at 5:00 p.m. they had to fight off elements of the 7th Parachute Division moving up to occupy the position. In the evening the 15th Division’s reconnaissance regiment reported that the Germans in Cleve seemed disorganized and unlikely to offer resistance. But south of Cleve its patrols seeking a route eastward found their way blocked by a coordinated defence in Materborn village. Advance Through the Floods- On the inundated flats beside the Rhine preparations for the 9th Canadian Infantry Brigade’s attack on 10 February were prolonged into the afternoon as new transport difficulties arose hourly. Supporting artillery could not get forward, and at 4:30 the two assaulting battalions crossed the start-line in Buffaloes without the prearranged barrage. On the right The Stormont, Dundas and Glengarry Highlanders had slight opposition. In little more than an hour they were in Donsbruggen, where they met the 2nd Gordon Highlanders, who had had to force their way forward through barricades of tree-trunks which the enemy had skilfully felled across the main Cleve road. Pushing on towards the Spoy Canal, by midnight the S.D. & Gs. had a company in Rindern, where fighting continued until daylight. Farther north The Highland Light Infantry of Canada were stopped outside Duffelward by machine-gun fire from pillboxes which covered the only approach. Next morning they took the town without loss and headed for the Canal. By mid-afternoon of the 11th the Glengarrians, having mopped up Rindern, had reached the west bank. At its northern end the Highland Light Infantry occupied Wardhausen in the early evening, and before midnight the two battalions held the whole line of the Canal. An early-morning message from the 3rd Canadian Division on 11 February reported that water was still the “greatest enemy”. The human antagonist here was the much-reduced 1052nd Grenadier Regiment, whose parent 84th Division could now muster fewer than 1000 fighting men. With Cleve lost there was no great incentive for a sacrificial defence of the scattered “island” villages in the flooded river flats. There were withdrawals in the dark, and although General Fiebig’s post-war recollections include the establishment of a temporary line through Griethausen and Kellen on the west bank of the Alter Rhein, both these places were in fact taken on the 12th without opposition–the former by The Highland Light Infantry of Canada and the latter by Brigadier Rockingham’s reserve battalion, The North Nova Scotia Highlanders. The 9th Brigade was now the only formation of General Spry’s “Water Rats” to remain fully committed in the flooded area. Because of the reduced enemy resistance and the increasing difficulties of maintenance the 7th Brigade had been withdrawn to Beek on the 11th, and the positions held by the 8th were being turned over to a single battalion. On the afternoon of the 12th the 7th Brigade relieved the Scottish Division’s 227th Brigade in Cleve, which was now free of any organized resistance. Although, in the words of one unit diarist, “Cleve had been ‘Caenned’ almost into oblivion”, the deep cellars beneath nearly every house had survived the attentions of Bomber Command, and gave the Canadians comfortable billets adequate protection from the occasional shell which the enemy still dropped into the city. Now that General Crerar’s left flank was pushed well ahead of the projected limit of “VERITABLE’s” first phase, the 9th Brigade’s activities were restricted to holding the line of the Alter Rhein and probing forward with not more than one company group from each battalion. During the night of the 12th-13th two Glengarry platoons entered Warbeyen on the main Cleve-Emmerich road, and when they withdrew to Kellen carried 13 prisoners with them. Next day The Highland Light Infantry of Canada patrolled eastward from Griethausen along the Rhine bank to within 2500 yards of the Emmerich ferries. At midday on the 14th, acting under revised instructions from Division to free the Cleve-Emmerich road and clear eastward to the Kalflach Canal, Brigadier Rockingham sent The North Nova Scotia Highlanders forward in Buffaloes. They had little trouble in clearing Warbeyen and Hurendeich in turn, but there was some stiff fighting before the Rhine bank was secured. The enemy’s losses included a number who attempted to escape across the river. The entire area between the Rhine and the Cleve-Kalcar railway was now under water, for on 11 February German engineers, acting on instructions from the First Parachute Army, had blown the sluice-gates of the Spoy Canal and breached the western dyke of the Kalflach Canal near Huisberden. This action nullified efforts by the engineers of the 3rd Canadian Division to reduce the flooding by piercing the main dyke at Nijmegen, where the level of the Waal was now below that of the water imprisoned within. On 12 February the 16th Field Company blasted a 100-foot gap which they subsequently enlarged to 300 yards.93 The flow into the river began at a rate of some 13 knots, and on the 15th our engineers reported a general decrease in the flood level as far east as Kranenburg.94 But there was to be no large-scale relief. The new breach east of Cleve was letting in as much water as was being drained off, and outside the dyke the river was rising towards its highest level of the winter (page 471, above). The Nijmegen-Cleve road was under water; but since the evening of 10 February four ferries, built by the 2nd Field Company R.C.E., had been carrying priority traffic around the flooded portion from Wyler to a point 300 yards east of Kranenburg.95 When Field-Marshal Montgomery visited the 3rd Canadian Division on the 15th, he toured the area in a convoy of amphibious vehicles. From the beginning of “VERITABLE” an unusual smoke-screen had concealed the operations of the 3rd Canadian Division from enemy watchers north of the Rhine. Potentially excellent observation posts provided by the tall chimneys of the numerous factories along the river bank and by the 270-foot Hoch Elten hill northwest of Emmerich were effectively blinded, so that not only the division’s tactical movements but the heavy maintenance traffic along the road between Wyler and Kranenburg were hidden from enemy view. As the 3rd Division advanced, its left flank was masked by a curtain of dense smoke which extended from the river bend north-east of Nijmegen along the south bank to within 2000 yards of its successive forward positions. By early March this was to grow to an almost continuous screen 30,000 yards long. The 2nd Canadian Corps Enters the Battle- By the end of the first week’s fighting the gains south of the Reichswald made it possible for General Crerar to deploy First Canadian Army on a two-corps front. Until now the restricted lines of advance had limited the role of the 2nd Canadian Corps to protecting General Horrocks’ left flank. An appreciation by Crerar’s headquarters on 1 February had foreseen the capture of Goch and the opening of adequate maintenance routes for the 30th Corps south of the Reichswald as “an essential prelude to any take over by 2 Cdn Corps”. If there were a likelihood of the battle becoming “loose” at this stage, the appreciation went on, the 30th Corps should continue to drive from Cleve on Calcar and Üdem until it was possible to switch the maintenance of the thrusting division (the Guards Armoured) from the northern to the southern axis. However, should things become “sticky”, the route through Cleve and the responsibility for the advance to the south-east ought to be turned over to the 2nd Canadian Corps. In the meantime, on the Wessex Division’s left troops of the 15th (Scottish) Division had been meeting stubborn opposition in the woods west of Moyland. On the 13th the 46th Brigade, advancing along the Cleve-Kalcar road, had reached Hasselt, a village north-east of Bedburg. Moyland, two miles to the southeast, was the objective for the 14th, but because the ground on either side of the highway was flooded, the brigade commander had shifted his axis 1000 yards to the right. He sent one battalion along a secondary road nearly a mile south of the highway, and another along the pine-covered ridge between.107 This forested area, consisting mainly of small conifers which formed no real obstacle to armour, extended for three miles from Bedburg to a point south-east of Moyland, from which village the wood derived its name. After a promising beginning the brigade’s attack slowed under heavy artillery and mortar fire, and the two battalions became involved in close and bitter fighting in the woods. By the morning of the 16th they were holding positions as far forward as the lateral road which crossed the ridge at a neck of the forest south-west of Moyland. The brigade’s bitter struggle for Moyland, which all were to agree (writes the divisional historian), “had been the worst experience they had endured since the campaign began”, was to last for three more days. On 15 February the 3rd Canadian Division took over the 15th Division’s front, at the same time reverting under the command of the 2nd Canadian Corps. The 46th Brigade came under General Spry that evening as the rest of the Scottish Division went into 30th Corps reserve to prepare for the assault on Goch. On the narrow front between the inter-corps boundary and the flooded Rhine flats, General Simonds had little room for deployment. 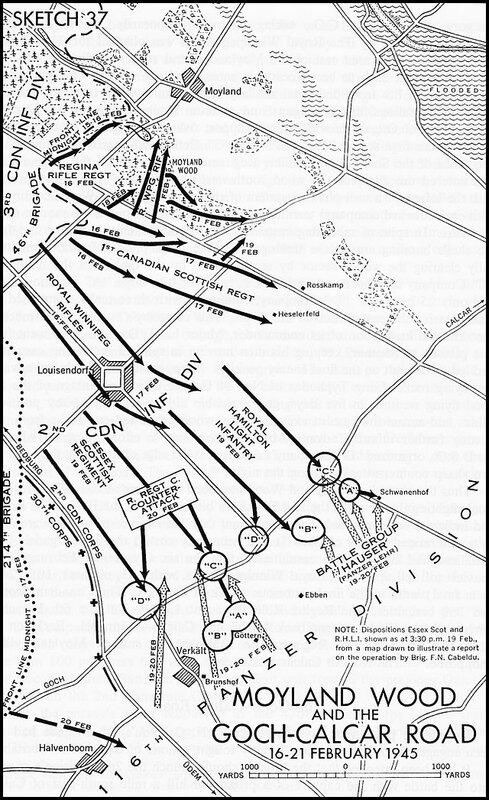 Canadian formations could at first be fed in only one brigade at a time, and on the afternoon of 16 February the 7th Brigade entered the battle. Its task was to pass through the 46th Brigade and open the way to Kalcar. The Royal Winnipeg Rifles, supported by two squadrons of the 3rd (Armoured) Battalion Scots Guards, was directed to seize hilly ground in the Louisendorf area three miles south of Moyland; while on its left The Regina Rifle Regiment, with one tank squadron, was to clear the woods closer to Moyland-those lying east of the lateral road, and forming a kind of peninsula to the main wooded area. The attack on the right went well. Kangaroos carried the Winnipeg Rifles through heavy shelling and rocket-fire to their objective, which they consolidated by five o’clock. Suffering remarkably few casualties, the battalion took 240 prisoners. On the left, however, the Reginas quickly ran into difficulties. Close to their start-line they came under heavy flanking fire from the left, although that part of the forest had been reported cleared by the 46th Brigade. The Reginas spent the rest of the day securing the woods west of the lateral road, ousting members of the 346th Fusilier Battalion and of the 60th Panzer Grenadier Regiment of the 116th Panzer Division. These fell back to the “peninsula”, whence their machine-gun fire effectively barred any crossing of the lateral road. As the Reginas “C” Company pushed forward along the southern fringe of the wood one of its platoons was counter-attacked and cut off. A renewal of the attack on the morning of the 17th achieved little. Heavy artillery and mortar fire disorganized the Regina companies at the edge of the wood. The enemy’s shells were being detonated by the treetops, resulting in a particularly deadly airburst. During the day, however, the 7th Brigade’s reserve battalion, the 1st Canadian Scottish, advanced under heavy fire across the open country on the right flank to capture high ground overlooking Heselerfeld and Rosskamp–farmsteads about half a mile south of the Kalcar end of Moyland Wood. A junior N.C.O., Acting Corporal P. P. Katchanoski, took charge when his platoon officer and sergeant became casualties, and directed the platoon’s defence against the many counter-attacks that developed in the next three days. His bold leadership won him the D.C.M. With the 7th Brigade’s southern flank thus secured General Spry decided to seal off the eastern end of the woods and then clear north-westward to the Moyland lateral road. Brigadier Spragge ordered an attack from the south, and at 12:30 p.m. on the 18th The Regina Rifle Regiment moved northward across the Bedburg road. Using Wasp flamethrowers “B” Company gained a footing among the trees, throwing the enemy back 200 yards, but “D”, trying to pass through, was halted by vigorous counter-attacks from the right flank. The Germans in the woods kept up a devastating machine-gun fire, and from across the Rhine their heavy artillery shelled the Canadian positions continuously. Nevertheless one of “D” Company’s platoons, commanded by Lieut. W. L. Keating, seized the central crest, and “A” Company, working north-westward, reached its objective on the lateral road. There the attack stayed, for the Reginas were too exhausted to exploit in the face of the terrific enemy fire. For five hours, until reinforced by the rest of “D” Company, Keating’s handful fought off repeated counter-attacks in hand-to-hand combat. The successful defence of the company objective brought Keating a well-deserved M.C.116 At the end of the third day of the battle for the woods the battalion’s casualties totalled more than 100. The Germans were continuing to move in fresh troops. The stern resistance encountered by the Regina Rifles came from a battalion of the 6th Parachute Division newly from North Holland. The 4th Canadian Armoured Division had had a sample of this formation’s quality at Kapelsche Veer. On 16 February Lieut.-General Hermann Plocher’s divisional headquarters had relieved the 84th Infantry Division between the Cleve-Kalcar road and the Rhine. At first Plocher had only the remnants of his 16th Parachute Regiment (which, we have noted, had been fighting hard since 10 February), elements of the 346th Infantry and some companies of the 7th Parachute Division; but he was temporarily reinforced shortly by the strong 19th and 21st Parachute Regiments of the last-named division. Then, on the night of 17-18 February, his own 18th Parachute Regiment began arriving at Kalcar, to be followed shortly by the 17th. On Plocher’s left flank the 116th Panzer Division was being slowly pushed back, leaving the Moyland area as a stubborn salient on which for several more, days the waves of our attacks were to break in vain. The failure to drive the enemy from Moyland Wood was seriously delaying the 2nd Canadian Corps’ planned advance. The 2nd Canadian Division was still uncommitted; its 4th Brigade had been in the Cleve area since the evening of 16 February, waiting to relieve the 7th Brigade. Accordingly the Corps intentions for the 19th were for the 4th Brigade to pass through the 7th’s battalions and seize objectives beyond the Goch-Kalcar road, which, it will be recalled, the 43rd Division had cut near Goch on the 16th. While the 5th Brigade relieved the 46th Scottish Brigade in the western part of Moyland Wood, the 7th was to complete clearing the eastern end. The strength of the German defenders still holding the wood seems to have been seriously underestimated. The brigade commander gave the 7th Brigade’s task to the Canadian Scottish, who were directed at the same time to improve their positions to the east and south by gaining more of the high ground overlooking Kalcar. In these circumstances the attack against the wood was made by one weak company. Since its advance on the 17th the battalion had suffered heavily from the enemy’s shelling and mortaring, and “C” Company attacked northward on the morning of the 19th with only 68 men. These crossed the Bedburg road and reached their objective near the wood’s southeastern tip with few casualties, but immediately came under a holocaust of fire followed by a counterattack which virtually wiped out the company. Only nine men escaped. The battalion’s northern flank, left open by this disaster to “C” Company, was quickly sealed by the regimental carriers and a troop of tanks from the Fort Garry Horse. The remaining Canadian Scottish companies made little headway towards Kalcar, and during the evening had to beat off six counter-attacks by Plocher’s paratroopers. A Scottish outpost established south of Heselerfeld was overrun. The battalion’s casualties for 18 and 19 February totalled 140, including 53 taken prisoner. Meanwhile the advance of the 4th Canadian Infantry Brigade on the right had improved the 7th Brigade’s chances against Moyland Wood, where the crust of the enemy’s defences had so far shown no sign of cracking. There was a change in the command of the brigade on the 20th, Lt.-Col. A. S. Gregory, the Reginas’ C.O., taking it over temporarily. A very carefully coordinated attack by The Royal Winnipeg Rifles was planned for 21 February. The whole wooded area east of the Moyland lateral road was divided into belts 300 yards wide, each to be successively saturated from west to east by a timed programme of fire from divisional artillery and mortars, while from the southern flank the battalions’ anti-tank guns and medium machine-guns of the Cameron Highlanders of Ottawa provided close support over open sights. At ten a.m., as fire over the first sector lifted, “A” and “C” Companies, each accompanied by two tanks of the Sherbrooke Fusiliers Regiment, moved through the Regina Rifles and entered the angle of the wood south-west of Moyland. The flamethrowers with the infantry (a well-planned system of refuelling kept three Wasps continually with each forward company) terrified the Germans and bolstered the morale of the attackers. In spite of mounting casualties, both from machine-gun fire and from the shells bursting among the treetops, the Winnipegs pressed forward, methodically clearing the woods sector by sector, aided by the tanks. In the final stage “C” Company had been reduced to a strength of 42, while “A” had no officers and only 25 men left. “D” Company, coming in with three tanks, completed the task, clearing the eastern end of the wood. This company’s success owed much to the skill and inspiration of its commander, Major L. H. Denison, who went from one platoon to another, keeping his men moving in spite of increasing casualties, and led the assault on the final enemy position. Throughout the Winnipegs’ advance low-flying rocket-firing Typhoons of No. 84 Group, taking advantage of the first good flying weather in five days, gave valuable aid by strafing enemy positions. Mines laid across the eastern exits from the wood prevented our tanks from supporting further infantry advance, but Denison, whose efforts were to win him the D.S.O., organized “D” Company’s defences at the edge of the trees; they repelled two sharp counter-attacks during the night. Thus the obstacle of Moyland Wood had been overcome at last. The 3rd Division’s fighting there recalls the 2nd Division’s bitter battle in the Forêt de la Londe, and indicates once more what an unpleasant task the capture of a forest area held by a determined enemy can be. It had been very costly; the 7th Brigade’s three battalions had suffered 485 casualties during the six days 16-21 February. The heaviest toll fell upon The Royal Winnipeg Rifles, with 183; of these, 105 (26 of them fatal) were in the final victorious attack of the 21st. The Canadian Scottish had 168 casualties, The Regina Rifle Regiment 134.121 But the 6th Parachute Division had pulled its front back to the line Kalcar-Hönnepel. Early on the 22nd the 5th Brigade’s Régiment de Maisonneuve entered Moyland village unopposed. The road to Kalcar was open. During the past three days Brigadier F. N. Cabeldu’s 4th Brigade had also been engaged in one of the most bitterly fought actions of Operation “VERITABLE”. It had been intended that the brigade should launch the 2nd Division’s re-entry into the battle with the capture of a prominent hill a mile south-east of Kalcar, but this target had been successively replaced by more limited objectives as the flanking threat from Moyland Wood persisted. Finally on 18 February General Simonds ordered an attack for noon next day to seize a zone of high ground, 1000 yards deep, extending north-east along the Goch-Kalcar road for 3000 yards from its intersection with the Bedburg-Üdem road. The operation would be on a two-battalion front, Brigadier Cabeldu placing The Royal Hamilton Light Infantry on the left and The Essex Scottish Regiment on the right, with The Royal Regiment of Canada in reserve. Each assaulting unit would be supported by a squadron of the Fort Garry Horse, who thus established their claim of being the first Canadian armour to fight in Germany. Because the attack was to be made across open country, the 1st Canadian Armoured Personnel Carrier Regiment provided enough Kangaroos to lift two rifle companies from each battalion. The fire-plan included support by the machine-guns and mortars of the Toronto Scottish Regiment and by fourteen field and seven medium regiments, plus two heavy batteries. Rain during the night of 18-19 February further softened the sodden fields over which the advance had to be made. By mid-morning the 4th Brigade units were forming up in The Royal Winnipeg Rifles’ battalion area. The start-line was the road running north-east through the Louisendorf crossroads; the other axis of the crossroads formed the inter-battalion boundary. Promptly at midday the guns opened fire, taking the enemy by surprise. The barrage rolled forward at armoured pace as the Kangaroos, led by the tanks, headed straight for their initial objectives, 2500 yards away. But the heavy going took its toll, and on each sector several personnel-carriers and Shermans bogged down close to the start-line, while on the left flank a number of tanks fell victims to mines. Heavy fire from a screen of 88-mm. guns along the Goch-Calcar road forced the Kangaroos to drop their troops short of their goal. The Carrier Regiment in all had seven vehicles knocked out, although three of these were later recovered. The leading R.H.L.I. companies, though suffering heavy casualties, managed to fight across the road to within 200 yards of their objectives–the Schwanenhof and Ebben farmsteads. On the right the Essex Scottish, whose targets were the buildings at Göttern and Brunshof, had some elements there at 1:45 p.m. But half an hour later they reported a counter-attack coming in. It was the first of a series of heavy blows launched by infantry and armour against their front and southern flank. The Essex fought back grimly and by half-past four had put “A” and “D” Companies on their objectives. The Royal Regiment of Canada had now reached their reserve positions, 1500 yards to the rear of the main road. By six o’clock more than 100 prisoners had been sent back, most of them from the 12th Parachute Reconnaissance Battalion. Then the enemy’s effort redoubled as the 47th Panzer Corps sent a fresh formation into the fight. Most opportunely for General von Lüttwitz, the Panzer Lehr Division had arrived the previous evening at Marienbaum, midway between Calcar and Xanten. Badly mauled in the Ardennes, its ranks had since been filled with young replacements; nevertheless, as it was about to show, it was still capable of fierce fighting. It seems to have had only 22 tanks actually ready for action on 19 February. Higher authority had decreed that it might be used for short counter-attacks, but not for holding a line of defence. The situation seemed made to order, and about 8:00 p.m. on the 19th it was committed against the Canadians holding the farms along the Goch-Kalcar road. It appears that a battle-group of Lehr attacked on the R.H.L.I. sector, and 116th Panzer Division units against the Essex. Since the Fort Garry tanks had withdrawn at nightfall to re-arm and re-fuel, for the moment our infantry was without armoured support. Throughout the night successive waves of Germans, supported by heavy artillery and mortar fire, drove against the 4th Brigade’s positions, inflicting severe losses. Towards midnight the Essex C.O., Lt.-Col. J. E. C. Pangman, who had previously been out of communication for some time, reported that the situation around his tactical headquarters on the road north of Verkält was “touch and go”, with “enemy tanks and infantry all about”. * About the same time the R.H.L.I. reported, “Heavy infiltration of enemy infantry and tanks around ‘B’ and ‘C’ Companies.” At this critical juncture the G.O.C. 2nd Canadian Division, General Matthews, released the 6th Brigade’s Queen’s Own Cameron Highlanders of Canada to Brigadier Cabeldu, who was thus able to use the Royal Regiment, strengthened by one and later two companies of the Camerons, to maintain his forward line. Cabeldu ordered the Royals to reinforce the Essex Scottish. “D” Company went forward, but returned on finding the Essex headquarters “held by enemy tanks and infantry”. At 1:35 Lt.-Col. Whitaker of the R.H.L.I. sent word that his “C” Company had been overrun and that he was mounting a counter-attack. All the men “left out of battle” were called forward to bolster the defences; and by morning the battalion’s counter-effort had restored its positions. Aid came with the arrival of a company of the Camerons, and a troop of Fort Garry tanks moved up in time to help beat off a strong daylight counter-attack. Meanwhile Brigadier Cabeldu had been organizing an attempt by the Royal Regiment (Lt.-Col. R. M. Lendrum) to recover the lost positions of the Essex Scottish and rally “B” and “C” Companies’ survivors, who were sheltering in scattered slit trenches. Preceded by heavy artillery fire, the attack went in at 9:30 a.m. After an hour’s stiff fighting contact was established with Lt.-Col. Pangman, who was holding out with the remnant of his headquarters in a farmhouse cellar. But so deadly was the enemy fire that it was 2:00 p.m., after a second Royal attack had been mounted, before carriers could reach the spot to evacuate the wounded and the weary headquarters staff. During the afternoon stragglers from the Essex trickled back; but it was not until next morning that “A” Company, which had been written off as lost, reappeared, having held its ground for 36 hours with only 35 fit men and some wounded. Altogether the two-day battle cost the Essex Scottish 51 killed, 99 wounded and 54 taken prisoner. The Royal Regiment had had 64 casualties. Pangman won an immediate D.S.O., as did Major K. W. MacIntyre, commander of the “lost” “A” Company. Six other members of the Essex Scottish received awards for bravery. One of them was C.S.M. F. L. Dixon, who got a second bar to his Military Medal from Dieppe. He was the only Canadian soldier to win the decoration three times in this war. All units have done an exceptionally fine job of fighting, and the RHLI “fortress” is an outstanding example of a well planned and executed operation and of the ability of our troops under good leadership and by sheer guts and determination to take and hold difficult ground against the enemy’s best. *Among the Canadians captured here was the commander of “A” Squadron, Fort Garry Horse, Major B. F. Macdonald, who, though wounded, continued to assist the infantry when his tank was knocked out on the objective. Concealing his rank from his captors, he escaped some ten miles behind the enemy’s lines, and the information he brought back was of great value in planning the Corps’ subsequent advance. He was awarded the D.S.O.